Marketing and sales functions have rarely been the best of friends and even today they sometimes still don’t communicate with each other in the best way. Marketing may blame sales for not following up on leads in a timely manner, while sales may fault marketing for the quality of leads not being up to par. This cycle can keep going around and around. However, a recent surge of the Chief Revenue Officers (CRO) role in companies, whose duty it is to look at the overall revenue cycle, shows that more and more companies are looking to mitigate these issues. The CRO helps sales and marketing teams align better by managing the entire revenue cycle from lead generation to closing the sale and beyond. According to HubSpot, 70% of buyers have done their research before they talk to Sales, and 59% prefer not to talk to Sales at all. This is even more of a reason for sales and marketing to work hand-in-hand. Both sales and marketing need to have a clear goal of what they want to achieve. Sales has a clear revenue number they are working toward while often marketing does not always have a set revenue number they are accountable for. Marketing needs to establish clear goals too. For example, how many leads need to be generated in a given time frame to reach a business or campaign goal? If you don't yet have a benchmark number to use, work backwards from your revenue goal and apply your average conversion numbers. This will allow you to establish the number of marketing qualified leads (MQLs) that marketing should aim to generate. Keep in mind that Marketing should also be involved in sales pipeline meetings to learn more about which leads converted and why/why not. This will show confidence that to sales that marketing is also invested in the quality of these generated leads. Sales and marketing need to have clear definitions of the following: Who is your target buyer? What makes someone a good fit as a qualified lead? What actions indicate that there is an interest/need from the customer? 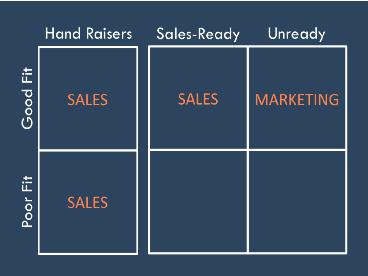 The below diagram from HubSpot illustrates a Lead Qualification Matrix which sales and marketing teams can use to help bucket leads into different categories and define the next steps. The matrix qualifies leads by ‘Fit’ (your buyer persona) and 'Action' (Hand Raisers who have downloaded an asset on your site, etc.). In most organizations hand raisers that are deemed a good fit will be called immediately. Some organizations will also call on sales-ready leads while others may leave those up to marketing for nurturing. Thus, it is up to your organization to closely define which categories should be followed up with and by whom. Every team should be aware of the definition of a qualified lead, and who is going to follow up in each of these categories. Similar to support teams, Sales and marketing teams should have a service level agreement (SLA) they commit to. An SLA is an agreement between sales and marketing, where Marketing promises to generate a certain amount of qualified leads, and sales promises to follow up on them within a specific time frame. The agreement must be reviewed by both teams and adjusted as needed. Smarketing meetings are meant for sales and marketing to come together to discuss any challenges they face and then collaborate on solutions. These meetings should be purely focused on determining what works and what does not. Is everyone sticking to the agreed upon SLA? If not, why not? Are marketing qualified leads correctly set? Does something need to be adjusted? Use this time and setting to brainstorm new ideas and ways to improve. Keep in mind, that this is not a pipeline meeting or a content strategy meeting. These meeting should happen regularly – depending on preference – but every 2 weeks is a good starting point. The power of good content stems from both sales and marketing. Marketing is often tasked with producing content on their own, without direct input from sales. However, to optimize results, sales and marketing must work together. Inbound marketing should not be just a marketing function but a marketing/sales function. Start by creating your ideal customer profile, then define your buyer personas based on the type/behaviors of the individuals working in your target organizations. To help build your buyer persona you can conduct customer interviews to learn about commonalities, demographics, job roles, knowledge/skills, challenges, etc. When you think about content, do not just create self-promoting, ‘sales-y’ content but also create educational content that helps customers solve a problem they may be facing. Instead of giving the same old product pitch, provide value-add content that will help your prospects/customers solve their everyday challenges. Produce content that is necessary in your selling process. Consult with the sales team to see what content will help them drive an opportunity along the pipeline. Your content should showcase your expertise and build the "trust factor" rather than just adding another piece of content to your resource library. As their ‘trusted’ source for quality content, customers and prospects will continually come back to you for additional information and knowledge. Make sure content is part of every step of the sales process by ensuring that you have something of substance to provide to prospects each time you reach out to them. This will allow your sales reps to follow up regularly with prospects with “I just thought of our last conversation and I wanted to send you our recent case study that addresses some of the points we talked about…”. 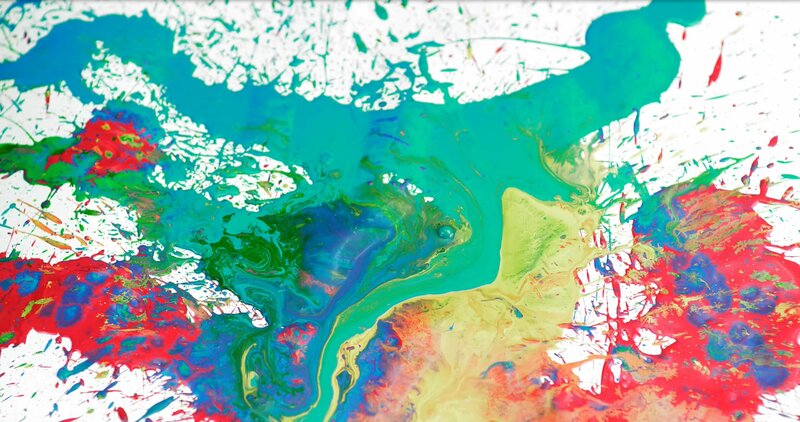 Experiment with different types and unique content media. Enthusem, for example, creates personalized video messages and allows you to send direct mail by combining video content with physical mail. You should also make interactive content part of the marketing and sales journey. Don’t stop at the customer sale. Content creation goes far beyond just making the first sale. Your teams need to work on creating content to drive new customers and continue to make existing customers happy. You should make sure they understand your products and services well and become believers in your organization. You will then have the opportunity to up-sell and cross-sell your other products/services to your existing customers. And, hopefully land a great testimonial for your website and promotions. Finally, in order to collaborate successfully there should be one source of truth for your data (either your CRM system or marketing automation platform) that both sales and marketing teams are using to have full and accurate visibility into each other’s activities. If you need help with setting up a successful closed-loop marketing process or a content strategy, we are here to help. Please contact us. Prior to joining Scholes Marketing, Lisa ran complex marketing campaigns for various companies, including Linkage, Inc., IDC, and Aberdeen Group. 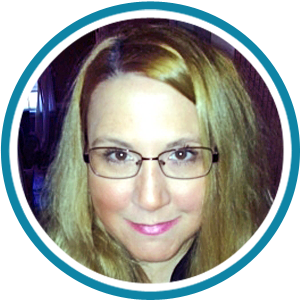 Lisa has broad experience in lead generation, attendee recruitment, marketing communications, event management, performance measurements and analytics. Lisa holds a BS in Marketing and Business Management from Bentley University. An avid sports fan (especially football), Lisa enjoys hanging out with friends and family, cooking, taking long walks with her yellow lab Teagan and spending time with her husband Mike.